Holding units for compost can be complex and expensive, homemade and simple, or somewhere in between. Turning units for compost are usually a bit more complex because they require a way to mix the organic material. These may be barrel units or simple three-bin units. Composting structures such as these can be built by a novice as long as looks aren’t important. Turning units for compost allow you to mix up the compost, providing oxygen to all the little microbes and bacteria that are breaking it down. They also allow you to easily spread moisture throughout the bin so you don’t have dry areas. It also increases the temperature, thereby enhancing organic breakdown. They can be difficult for some people to turn if they are heavily loaded but some barrel varieties are designed to be fairly easy to use. With just a little lumber or a plastic barrel, you can build a compost turning unit. Barrels are typically mounted on a frame with a handle attached to allow turning. You can mount the barrel horizontally or vertically. Attach barrel compost turning units with steel pipe mounted on cinder blocks and use a metal pipe flange for the crank arm. Drill holes and install a door with a latch on the side for easy access. You can get as fancy as you want but the important part is that there is oxygen, access, and a simple way to mix the contents of the barrel. Wooden bins should each be 3 x 3 x 3 feet in diameter with an open end. Build three bins to allow for consistent composting with each bin containing material at different stages of decomposition. The last bin will have the most complete compost and be harvested for use first. Use 2 x 4 lumber for most of the sides and 2 x 6 for the bottom rains. Set the boards in like slats using screws to tie them into horizontal pieces. Build three sides with an open or partially open front for ease of access. Save material for the bins in bulk so that all the material will be at the same composting rate. Compost turning units aren’t the only way to recycle organic waste. 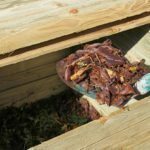 Kitchen scraps can become worm food in vermicomposting. Yard waste will break down just fine in a compost pile, especially if you keep it lightly moist, turn it with a pitch fork and cover it with black plastic. Compost bins are traditional tried and true methods to decompose organics and may be as simple as a garbage can with some holes punched in the sides. Composting isn’t difficult and the benefits outweigh and work involved, so get out and build a composting structure of some sort for your organic waste.